There are many levels to the world of bird watching, from casual bird watchers who just enjoy watching birds on a stroll or the occasional trip to a nature reserve, to the more serious birders, those who spend most of their free time watching birds, searching areas and keeping records of what they see. Thrown into this mix is twitching. A British term, twitching means the pursuit of a previously-located rare bird. Of course its not black and white, you are not necessarily just a birder or a twitcher, but in many cases when you start twitching you tend to get caught up in it, travelling hundreds of miles to see one rare bird and add it to your list. As with many hobbies, twitching tends to have its own vocabulary; terms that mean one thing to the general Joe Bloggs may mean something entirely different to the twitching fraternity. One such term is to dip. This means you miss seeing a bird that you went looking for. Personally I have done the odd bit of twitching over the last few years, although I have always gone for birds within my local area. The lure of seeing a rare bird on your home turf is often just too good an opportunity to miss. 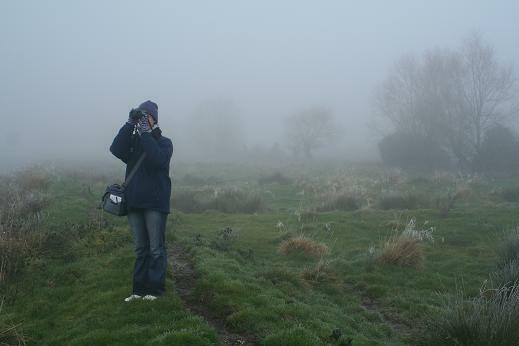 Out birdwatching – in these kind of conditions its easy to dip a bird! Just prior to Christmas a bird turned up in Thetford that I was intrigued to see, and would twitch given that it was spotted less than five minutes from my house! The bird was a Black-bellied Dipper. Now we get Dippers in the UK, predominantly in the west and north of the country. 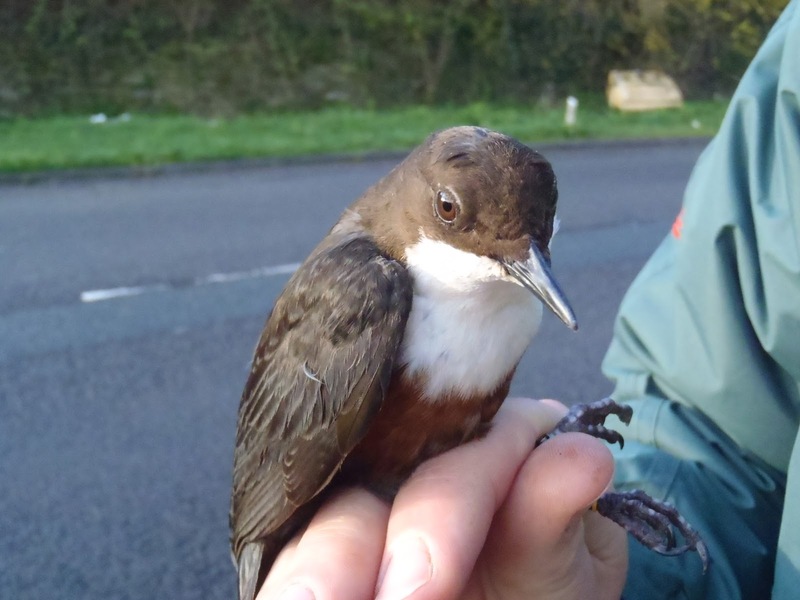 Head to many fast flowing rivers in Scotland and Wales, or upland areas of northern England or even south west England, and you may just encounter this fantastic little bird that will hold itself under water in order to feed. These birds are however a subspecies with the scientific name Cinclus cinclus gularis. The nominate subspecies, i.e. the originally described population is known as Cinclus cinclus cinclus, or the Black-bellied Dipper. This subspecies breeds throughout northern Europe, migrating to milder regions during the winter, including occasionally to Britain. Physically the differences may seem quite subtle, Black-bellied Dippers have no chestnut on the lower breast unlike our resident Dippers. When a Dipper turns up in eastern Britain in winter its worth taking a closer look as more often then not it is a visitor from the continent. Although technically the same species as those Dippers I had seen in the past, I was still interested in seeing this bird, and so on a number of occasions I headed down to the river, with Barley in search of the bird which by now had generated quite a bit of attention on twitching and birding websites. And each time we dipped. While the reports kept coming in of the bird being seen, each time we went it was no where in sight. The first weekend into the new year and whilst on a general walk with friends along the river we spied a huddle of people, all wearing binoculars, some carrying telescopes and more than a few pointing very long lensed cameras at the same bit of river; the unmistakable sign that an unusual bird was about. It had to be the Dipper. 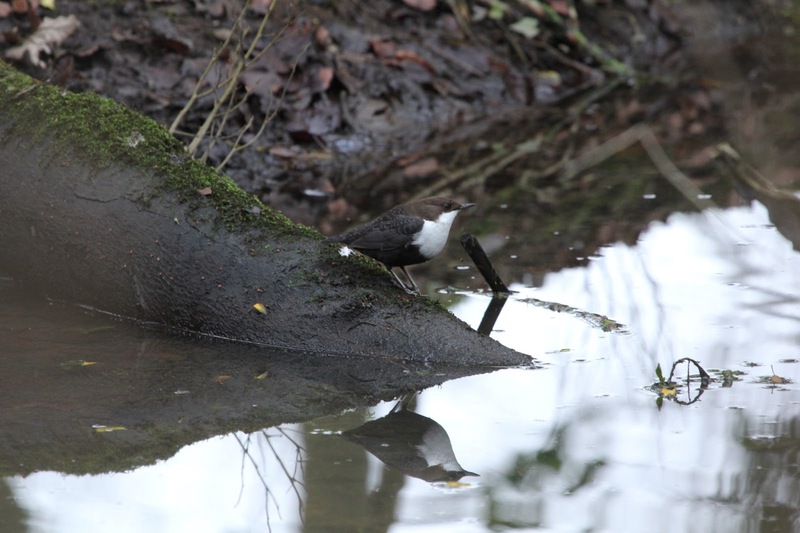 Approaching carefully and quietly along the muddy bank, there perched up on top of a log for all the world to see was the Black-bellied Dipper. So many times I’d dipped it and now there it was, on full view, characteristically bobbing up and down and seemingly oblivious to the clicking cameras and quiet murmurs of the spectators.